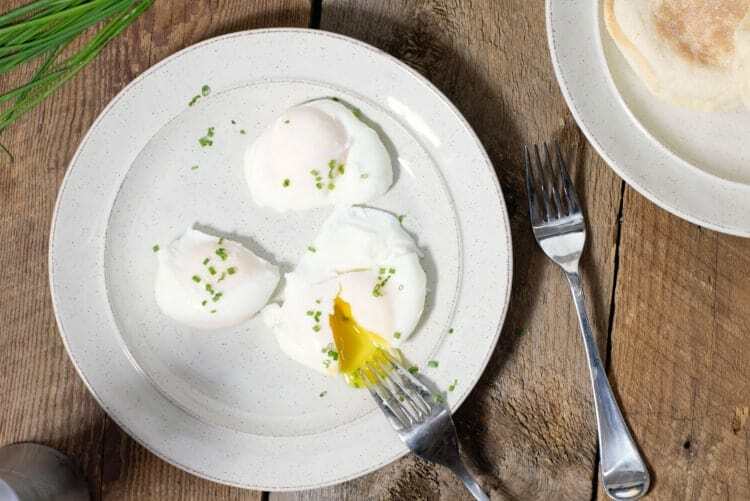 Whether you simply enjoy eating a few poached eggs for breakfast, or are making eggs benedict for brunch, knowing how to poach eggs at home is a good skill to have. 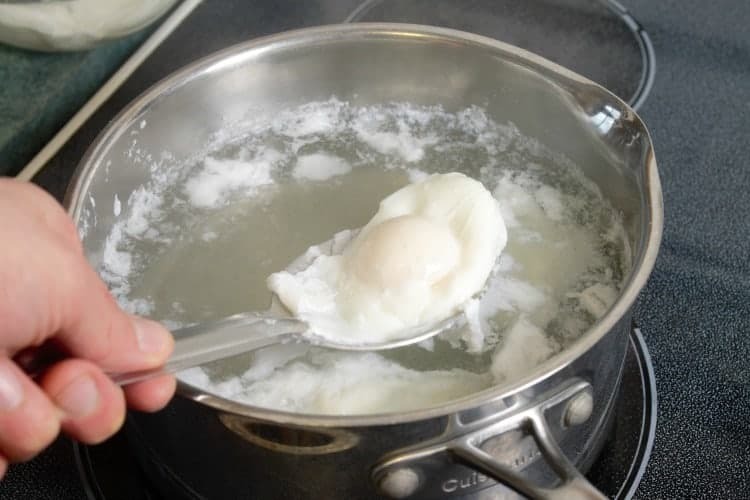 A relatively straight forward process, ‘poaching’ refers to the process of cooking food, ( in this case eggs) in simmering water at about 160- 180F or 71-82C. 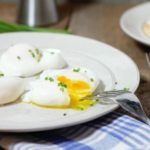 So How Do You Poach Eggs Perfectly? You may have heard horror stories of people poaching eggs only to have them break apart, look hideous, or be totally overlooked. People will say you need to swirl the water just so or that you have to constantly keep swirling the water as the eggs cook. In my experience, if your water is the correct poaching temperature (160- 180F or 71-82C), and you have just a splash of vinegar in the water, your eggs will poach just fine regardless of if the water is swirling or not. Adding to much vinegar will cause the eggs to become rubbery, and taste of vinegar, you really need just a tiny splash. Another popular technique when poaching eggs is to use a dish to gently lower the egg into the simmering water. This will reduce the amount of egg white that may ‘float’ away initially. If using fresh eggs, you will have minimal egg ‘tendrils’ as the egg white is firmer and not as runny as in older eggs. 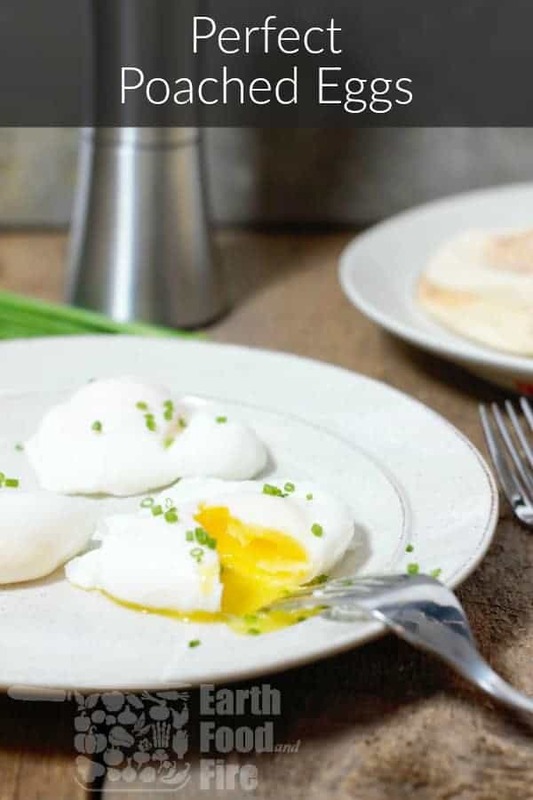 Fortunately, it really isn’t that difficult to poach eggs if you follow a few simple steps. If you’ve never poached an egg before, I would suggest doing a trial run to get a feel for the process before making something like these smoked salmon eggs benedict for a grou of friends. Put a large pot of water on the stove and bring it to a simmer. It’s ok if it boils, you’ll just need to let the water cool a little before starting. Once you see bubbles forming on the bottom of the pot and rising to the surface in a stream your good to go. (the technical poachingg temperature of water is 85C). Add one tbsp of vinegar to the pot per 2 liters of water. Give the simmering pot of water a gentle stir in one large circular motion, then gently crack your eggs into the water. You don’t need to use a special dish, as long as you can crack the eggs quickly and without making a mess. You’ll see the egg white start to pull together and coagulate as it sets in the hot water. Cook the egg for at least 2 minutes to set the white and be able to remove the egg from the water with a slotted spoon. Once the eggs are finished poaching, remove them from the pot with a slotted spoon. Serve the eggs right away, either on their own garnished with some fresh chive or on an English muffin topped with hollandaise. 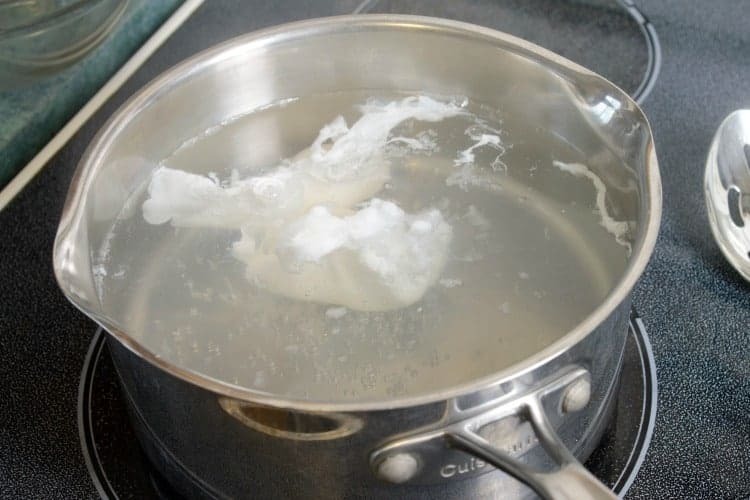 If you see tendrils of egg floating off as you crack the egg into the water, this is ok. You’ll see less of this with very fresh eggs, but the main white of the egg will still pull together around the yolk as it cooks. Part way through the poaching, gently swish the water to make sure the eggs are not sticking to the bottom of the pot. Pre-poached eggs will last in for 2 – 3 days in the fridge if kept in clean water. To re-heat pre-poached, cooled eggs, simply drop them into simmering water for 1-2 minutes. Serve immediately. Keyword How long do you poach eggs for?, Is vinegar necessary for poached eggs? Once you see bubbles forming on the bottom of the pot and rising to the surface in a stream your good to go. 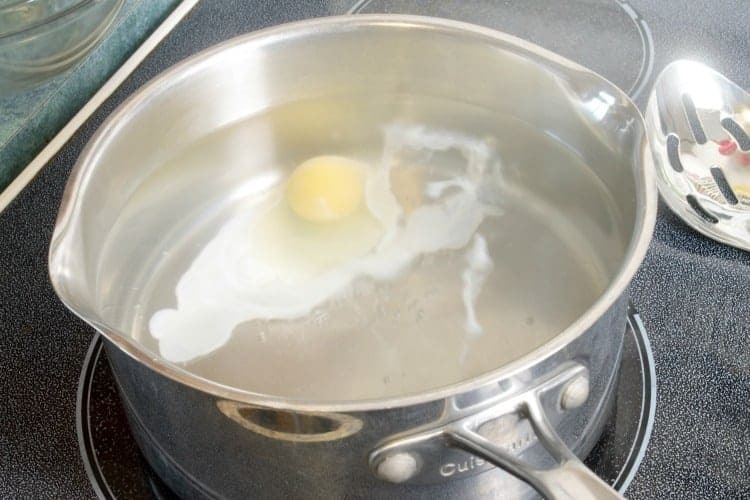 Give the simmering pot of water a gentle stir in one large circular motion, then gently crack your eggs into the water. You don’t need to use a special dish, as long as the eggs are fresh and you can crack the eggs quickly and without making a mess. You’ll see the egg white start to pull together and coagulate as it sets in the hot water. Cook the egg for at least 2 minutes. 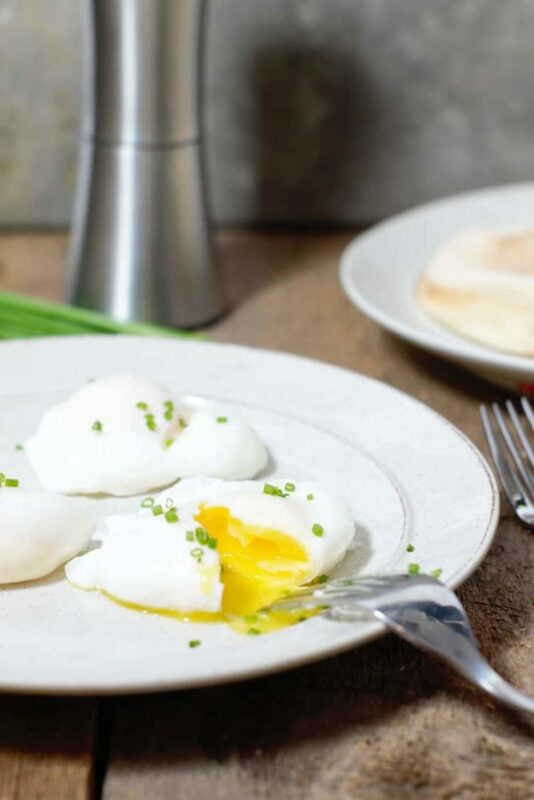 Poach the eggs for 3 minutes for soft yolks, 4-5 minutes for medium yolks, or 6 minutes for hard yolks. If you are poaching the eggs ahead of time to make serving eggs Benedict easier and faster, prepare an ice bath in which you can cool the eggs. Pre-poached eggs will last in for 2 – 3 days in the fridge if kept in clean water. To re-heat pre-poached, cooled eggs, simply drop them into simmering water for 1-2 minutes. Serve immediately.